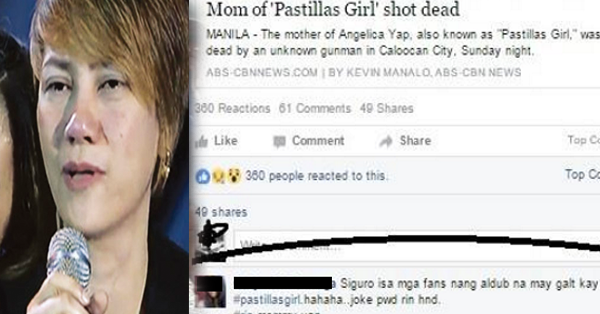 Controversial: Girl Who Blame ALDUB fans for the Death of Pastillas Girl's Mom Enraged the Netizens! 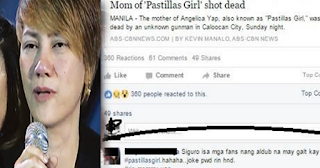 Everyone was in shock when the news about Angelica “Pastillas Girl” Yap’s mother died because of the gunshot at the back of her head. Fan and supporters extend their condolences to the Yap family regarding on what happened. Even the non-fans sympathized with Angelica and prayed for the justice. After the news about the incident, there was a footage that goes viral in the social media. It is a 60-second recording that was capture by one of the CCTVs of Barangay 131, Caloocan where the incident took place. While supporters and fans of Pastillas Girl were also mourning about of the incident, one woman is brave enough in connecting the incident with the remarkable AlDub love team. The unknown girl made her first comment on the video that was posted by ABS-CBN. 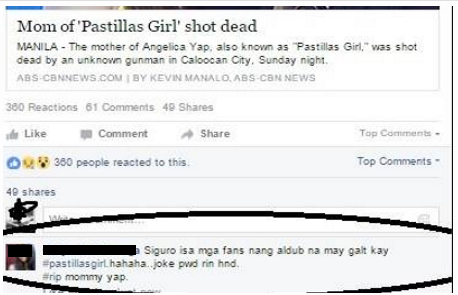 “Siguro isa sa mga fans nang AlDub na may galit kay #pastillasgirl. Hahaha. Joke pwd rin hindi. #RIPMommyYap”, she said. Because of this comment, supports and fans are very furious. But the identity of the woman is kept hidden by the page “Kupal Lord” who posted the video on Facebook. Still, police officials and investigators were gathering information about the incident with the help of the residents that saw the incident. KING INA ! MO Te! hayup ka! dinamay mO pa unq ALDUB! bka nqa IKAW! yunq PUMATAY o kya TATAY MO!